To say that this DVD is wonderful is an understatement. 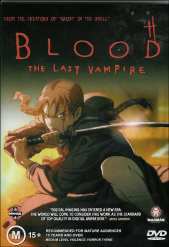 Blood the Last Vampire has something extremely special about it, even taking into consideration it's extremely short running time of 46 minutes. Using a unique blend of both traditional anime and cutting edge Computer Generated animation, Blood is the mysterious tale of a young girl Saya who is sent into an American Airforce base in Japan just as the Vietnam War is about to commence. There have been killings on the base and the agency that Saya works for know that they are vampires, creatures of legend, feasting on the blood of their dying victims. The animation is incredibly clear and unique in it's depiction of characters and environments. The line work is very much unlike a lot of anime currently on the market and definitely shows a distinctive style. Characters are exquisitely drawn and animated and frankly some of the sequences are breathtaking to say the least. Possibly the only drawback to this DVD is how incredibly short it is for a feature presentation. The period of time it runs for prevents character development to the extent that I would have liked. You are so taken in by the initial opening scenes that you want to know as much as possible about Saya and it doesn't happen. Also there is a scene at the end of the movie that needed further exploration, I won't spoil anything here but when you view it, readers should know the one I am referring to. Blood the Last Vampire also features a number of extras, however the one worth watching is the making of Blood. Here we get to see the animators who made this exquisite movie and what they made of their own creative process. The funny thing about this is that due to the short length of the feature, this extra runs almost as long as the actual title itself! Very highly recommended for those interested in something slightly different and just to witness some spectacular art and animation. It looks and sounds wonderful and is a treat to watch.